Course 1 of 4 that comprises the Architecture and Systems Engineering Professional Certificate Program. This course may be taken individually, without enrolling in the professional certificate program. Understanding and managing system complexity is a critical challenge today as systems continue to grow in scale and complexity. This course is designed to help engineers address changes which induce, propagate, and amplify risk in the increasingly complex products and services they are required to develop. Students will get a solid grounding in complex systems, analysis of complex systems, and complexity management. Are you a Boeing/NASA employee? There is a private cohort and special pricing for all Boeing and NASA employees. Please go here for more information. Motivate the need for system architecture by articulating the ideas of minimized rework and by offering examples of complexity in modern systems. Contrast several definitions of system architecture and construct a personal definition from your career examples. Differentiate systems thinking from other kinds of "thinking;" define a system, and articulate examples of things that are and are not systems. Apply system thinking to provide a perspective on a given project. Describe the architecture of systems and identify both architectural decisions and non-architectural decisions. Define and illustrate the system boundary and use it to identify system interfaces. Identify the constituent elements in architecture representations and place these in the context of the overall documentation of the system. Provide constructive criticism on the system architecture representations of others, including checking for completeness and consistency. Articulate more solution-neutral and less solution-neutral framings of a problem, and evaluate how solution-neutral to be for a given problem. Construct a design DSM, either by analyzing the design or by converting a graph of the system. Construct a process DSM and identify how it is different from a design DSM. Given a DSM, apply a sequencing algorithm to sort the components into modules or to sort tasks into groups. Describe rework and articulate the principles by which an analysis of change propagation could be conducted from a database of changes. Define the role of the architect and the stakeholders with whom the architect should work. Define the deliverables of the architect, with references to architectural frameworks and your career examples. Dr. Cameron balances several complementary roles as the Director of MIT’s System Architecture Lab, a Lecturer in System Design and Management, and an industry consultant on platform strategies. His interests include technology strategy, system architecture, and the management of product platforms. He conducts research related to platform management structures, accounting methods in platforming, strategic management of stakeholder needs, and network analysis of customer requirements. As a consultant, he works with companies to develop strategies for entering new markets, building flexible product lines, and achieving cost savings. His clients include Fortune 500 firms in high-tech, aerospace, transportation, and consumer goods. Previously at MIT, Dr. Cameron ran the Commonality study, a 16-firm investigation of platforming returns that identified systemic downward pressure on commonality among firms, partially resulting from challenges related to capturing the costs of variety. Before coming to MIT, he worked as an engagement manager at a management consultancy and as a system engineer at MDA Space Systems, where he built hardware that is currently in orbit. He has also directed research projects for BP, Sikorsky, Nokia, Caterpillar, NSTAR, AMGEN, Verizon, NASA, ES, and Skoltech. He received his undergraduate degree from the University of Toronto, and graduate degrees from MIT. Prof. Crawley currently serves as President Emeritus, Skolkovo Insitute of Science and Technology, Moscow and as Director of the Bernard M. Gordon – MIT Engineering Leadership Program, an effort to significantly strengthen the quality of engineering leadership education for competitiveness and innovation. From 2003 to 2006 he served as the Executive Director of the Cambridge – MIT Institute, a joint venture with Cambridge University, funded by the British government and industry, with a mission to understand and generalize how universities act as engines of innovation and economic growth. In this capacity he was in close consultation with the British Government on issues of science and innovation policy. For the previous seven years, he served as the Department Head of Aeronautics and Astronautics at MIT, leading the strategic realignment of the department. Dr. Crawley’s early research interests centered on structural dynamics, aeroelasticity, and the development of actively controlled and intelligent structures. Recently, his research has focused on the domain of the architecture and design of complex systems. Dr. Crawley’s work spans a range from the development of underlying theory, typified by a recent paper on the Algebra of Systems, to the development of methods and tools, such as Object Process Networks. Currently he is engaged on both NASA and oil exploration system designs. Dr. Crawley received an SB (1976) and an SM (1978) in Aeronautics and Astronautics, and an ScD (1981) in Aerospace Structures from MIT. An international leader in systems engineering research, Dr. de Weck focuses on how complex man-made systems such as spacecraft, automobiles, printers, consumer products, and critical infrastructures are designed, manufactured, and operated. His research has impacted complex systems in space exploration (NASA, JPL), oil and gas exploration (BP), and sophisticated electromechanical products (Xerox, Pratt & Whitney, GM, DARPA). He currently leads the MIT Strategic Engineering Research Group, which has developed quantitative methods and tools that explicitly consider manufacturability, commonality, flexibility, robustness, sustainability, and other characteristics. Under his direction, this group’s achievements include the Adaptive Weighted Sum (AWS) method for resolving tradeoffs amongst competing objectives, the Delta-Design Structure Matrix (DDSM) for technology infusion analysis, Time-Expanded Decision Networks (TDN), and the SpaceNet and HabNet simulation environments. Dr. de Weck is also a Fellow of INCOSE and an Associate Fellow of AIAA, and he serves as Editor-in-Chief of the journal Systems Engineering. From 2011 to 2013, he served as Executive Director of the MIT Production in the Innovation Economy (PIE) project. Previously, from 2008 to 2011, he served as Associate Director of the Engineering Systems Division (ESD) at MIT. Among the honors he has earned in his career are the Frank E. Perkins Award for Excellence in Graduate Advising (2006), the Marion MacDonald Award for Excellence in Mentoring and Advising (2010), and an AIAA Teaching Award (2012). He has authored three books on systems engineering and 250 peer-reviewed papers. Dov Dori, Harry Lebensfeld Chair in Industrial Engineering at the Technion, Israel Institute of Technology, is Head of the Enterprise System Modeling Laboratory at the Faculty of Industrial Engineering and Management, Technion, and is a frequent visiting professor at MIT's Systems Design and Management, where he advises graduate students and lectures on a regular basis. His research interests include model-based systems engineering, conceptual modeling of complex systems, systems architecture and design, software and systems engineering, and systems biology. Prof. Dori invented and developed Object-Process Methodology (OPM), the 2015 ISO 19450 standard. Steven Eppinger is Professor of Management Science at the MIT Sloan School of Management. He also holds the General Motors Leaders for Global Operations Chair and has a joint appointment in MIT's Engineering Systems Division. He is currently the faculty co-director of the System Design and Management program with masters degree tracks in integrated product development and in complex system development. Dr. Eppinger is one of the most highly recognized scholars in the area of product development and technical project management. His research is applied to improving complex design processes in order to accelerate industrial practices. He is a pioneer in development of the widely used Design Structure Matrix (DSM) method for managing complex system projects. Prof. Eppinger received S.B., S.M., and Sc.D. degrees from MIT's Department of Mechanical Engineering before joining the MIT faculty in 1988. It’s professional development– the MIT way. MIT xPRO courses provide professional development opportunities to individuals, teams, and companies across the world. Leveraging the latest learning technologies, MIT xPRO courses and programs are designed to provide a high quality education experience while accommodating your busy life. MIT xPRO learners are not only scientists, engineers, technicians, managers, and consultants– they are change agents. They take the initiative, push boundaries, and define the future. Participants of this course who successfully complete all course requirements will be awarded a Certificate of Completion by MIT xPRO after the course has ended. Grading: Letter grades are not awarded for this course. Participants of this course who successfully complete all course requirements in order to earn a Certificate of Completion are eligible to receive 2.5 Continuing Education Units (2.5 CEUs). CEUs are a nationally recognized means of recording noncredit/non-degree study. They are accepted by many employers, licensing agencies, and professional associations as evidence of a participant’s serious commitment to the development of a professional competence. This program is well suited for engineers, system architects, directors, senior managers, and technical leads who want to optimize their operational, manufacturing, and design systems. While it is appropriate for professionals across a wide range of industries, it may be of particular interest to those in aerospace, automotive, defense, and manufacturing. Departmental teams are encouraged to apply. Video tutorials and research-based content from a host of MIT professors. Guest lectures from industry experts from Boeing and NASA, US Air Force, General Electric, General Motors, Apple, MAN Truck and Bus AG, as well as case studies drawn from different engineering fields. Group projects based on real-world examples. Robust collaborative environment to network and connect with students. Network with classmates and become part of the MIT professional community. Learn online—when and where you would like—as long as you complete each module by the assigned time. 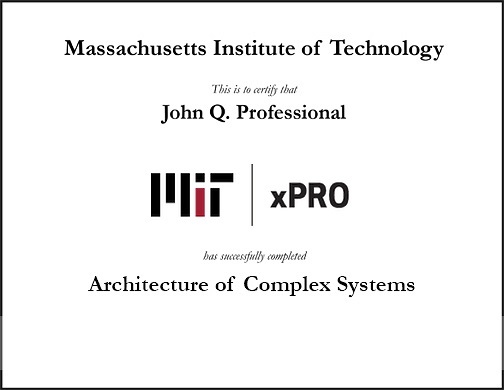 Earn a Certificate of Completion and 2.5 CEUs from MIT xPRO. Featuring guest lectures and content from industry partners Boeing and NASA, this program offers valuable lessons based in real-world examples. As a manifestation of the Space Act Agreement signed by NASA and Boeing, this online course is designed to support education for a science, technology, engineering, and mathematics capable workforce. Throughout the course, you’ll have the opportunity to network with your classmates and collaborate on projects. With special features such as content commenting and theme tagging, the online platform provides an interactive, flexible learning experience. Program materials: PDFs of faculty PowerPoint presentations and resources presented in the course Wiki. 90-day access to archived course materials: Videos, discussion boards, and content. Complete course transcript: Synchronized video transcripts and a compiled transcript of all course lectures. MIT xPRO Digital Programs are designed to fit the schedules of busy professionals. That’s why each course is self-paced and available online 24 hours a day, 7 days a week. Each video module is pre-recorded, enabling you to complete it any time before the assigned due date. While you may complete all the assignments in rapid succession, most participants find it beneficial to adhere to the weekly schedule and participate in online discussion forums along the way. Each course requires a time commitment of three-to-five hours a week comprised of videos, assigned reading, projects, and peer-to-peer evaluations. Access to our courses requires an Internet connection, as videos are only available via online streaming, and cannot be downloaded for offline viewing. Please take note of your company's restrictions for viewing content and/or firewall settings. You can also view the content on your mobile device. What do I do if I have questions about this course? If you have any questions about this program or the individual courses that comprise this program, please email: mitxpro@mit.edu. Unfortunately, US sanctions do not permit us to offer this course to learners in or ordinarily residing in Iran, Cuba, Sudan, and the Crimean region of Ukraine. MIT xPRO truly regrets that US sanctions prevent us from offering all of our courses to everyone, no matter where they live. What do I need to do to register for this course? Go to mitxpro.mit.edu and click on the program title. Then click “Enroll Now.” You may be prompted to first register for a MIT xPRO account if you do not have one already. Complete this process, then continue with checkout and pay for the course. After you complete registration, you will receive a purchase receipt and confirmation/instructions via email. There are two ways to register multiple individuals at once. Once the course is added to your cart, you can select the number of seats you would like to purchase. You can then pay using a valid credit card. For a group of 10 or more individuals, you can pay via invoice. To be invoiced, please email mitxpro@mit.edu with the number of individuals in your group you want to register. Please note that our payment terms are net zero, and all invoices must be paid prior to the course start date. Failure to remit payment before the course begins may result in removal from the program. No extensions or exceptions will be granted. Individual registrations must be completed by September 21, 2018. For group sales, purchases can take place up until September 16, 2018. Please note that once registration has closed, no late registrations or cancellations will be granted. Individual participants must complete registration and pay online with a valid credit card at the time of registration. MIT xPRO accepts globally recognized major credit or debit cards that have a Visa, MasterCard, Discover, American Express or Diner's Club logo. Invoices will not be generated for individuals, or for groups of less than 10 people. However, all participants will receive a payment receipt. Payment must be received in full; payment plans are not available. Cancellation requests must be submitted to MITxPRO@mit.edu. Cancellation requests received after September 21, 2018 will not be eligible for a refund. To submit your request, please include your full name and order number in your email request. Refunds will be credited to the credit card used when you registered and may take up to two billing cycles to process. Carefully review the program description page, which includes a description of program content, objectives, and target audience, and any required prerequisites. How many hours per week will I have class or homework? Each course in the program requires a time commitment of four-to-five hours a week comprised of videos, readings, project-based works, and peer-to-peer collaborations. How long will the program material be available online? Program materials for each course will be available to registered and paid participants for 90 days after each course’s end date. No extensions may be granted. Learners who successfully complete the program within one year will receive a Professional Certificate from MIT. In addition, a Certificate of Completion will be awarded for each course you successfully complete. Letter grades are not awarded for this program. All four courses that comprise the program are pass/fail. This course does not carry MIT credits. MIT xPRO offers non-credit/non-degree professional programs for a global audience. Participants may not imply or state in any manner, written or oral, that MIT or MIT xPRO is granting academic credit for enrollment in this professional course. None of our Digital courses or programs award academic credit or degrees. Letter grades are not awarded for this course. Course participants who successfully complete all course requirements are eligible to receive Continuing Education Units (CEUs) from MIT. CEUs are a nationally recognized means of recording non-credit/non-degree study. They are accepted by many employers, licensing agencies, and professional associations as evidence of a participant’s serious commitment to the development of a professional competence. CEUs are based on hours of instruction. For example: One CEU = 10 hours of instruction. CEUs may not be applied toward any MIT undergraduate or graduate level course. Participants who successfully complete a Digital Programs course are considered MIT xPRO Alumni. Only those who complete an undergraduate or graduate degree are considered MIT alumni. Each video for this course has been transcribed and the text can be found on the right side of the video when the captions function is turned on. Synchronized transcripts allow students to follow along with the video and navigate to a specific section of the video by clicking the transcript text. Students can use transcripts of media-based learning materials for study and review. What are the technical requirements to participate in this course?